Many therapists recommend that couples schedule regular check-ins and time together to talk through issues in the relationship. Sometimes it is merely a suggestion, and sometimes it is assigned homework stemming from relationship or marriage counseling sessions. Either way, emphasis is put on scheduling concrete time, rather than leaving it as a vague, open-ended invitation. This time, referred to here as “us time,” differs from “quality time” in that there is an emphasis on addressing problems and talking about the relationship itself outside of therapy sessions. Scheduling time to talk about relationship issues may sound like an obvious suggestion coming from a relationship and marriage therapist, yet the benefits of “us time” are not always directly spelled out. Some people might dislike the idea of scheduling “us time” because it feels formal and inorganic. However, “us time” is about overcoming the awkwardness of voicing thoughts and feelings together without a counselor present. It is about acknowledging and addressing reality, even if that is uncomfortable, and maintaining the love that brought you together in the first place. Communicate about how you are communicating: Do you find yourself or your partner speaking with sarcasm, contempt, aloofness, a raised voice, too seriously or not seriously enough? “Us time” is a chance to talk about issues of tone, connotation, attitude and how to “fight fair” in a relationship, using the skills your marriage counselor teaches. It is about how, not just what is said. This is sometimes called meta-communication, and it can help enhance your ability to understand and be understood. Feedback can feed the relationship: One common complaint in relationships is complaining itself and that either or both partners fail to acknowledge the other’s contributions and positive deeds. “Us time” provides a good opportunity to acknowledge what is working and what helpful, kind or effective things the other person has done. Also important is the chance to address what needs improvement in the relationship and work towards agreements and compromises that move the relationship forward outside of therapy sessions. Shelving the conflict temporarily: By having regularly scheduled times to talk about the relationship without a relationship and marriage counselor present, couples can put issues “on the shelf” to be brought down and discussed at a later time. This allows you to attend to other things required in the moment, knowing that issues will not get swept under the carpet or ignored. In addition to being free to focus on other required tasks of the day, while the issue is “on the shelf,” you both have time to process thoughts and emotions before having a deeper discussion. This is particularly helpful if anyone has a tendency to either freeze up or be more emotionally volatile in the moment and means you don’t need to wait for your next session with a marriage counselor to work through it. Forego the internal debate of timing: Have you ever been caught in the dilemma of not knowing when to talk to your partner about bigger issues? When you’re in the middle of a specific conflict, bringing up the bigger issues often results in needless escalation. However, following the advice of “wait until everyone is calm” can result in postponing important conversations. If you’re waiting for your partner to be in just the right mood to discuss the relationship or for your next therapy session with a counselor, you risk waiting too long. 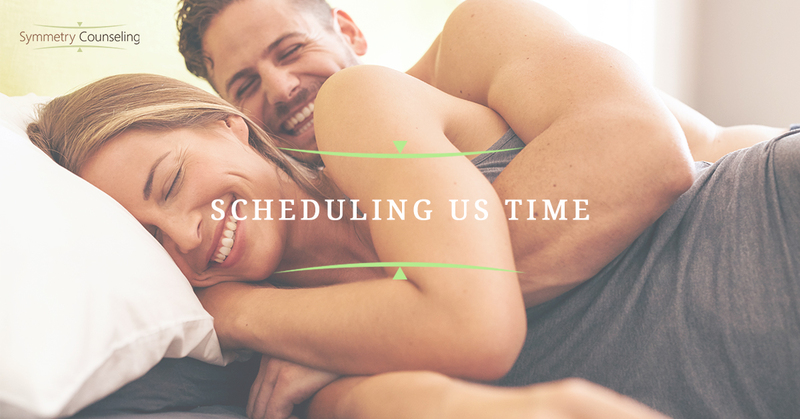 Scheduling “us time” and sticking to the schedule helps alleviate the worry of when to talk with your partner and having to seek a particular mood or wait until your relationship and marriage counselor is there to mediate and facilitate. Attain greater intimacy: Regularly scheduled “us time” can present the opportunity for deeper intimacy. Talking about the relationship, especially if done with an emphasis on eye contact, hand holding or cuddling, might lead to shared vulnerability and chemistry. Although the focus of “us time” should not necessarily be on physical intimacy, this can be an added benefit of the routine. As long as real issues are discussed and not pushed aside to wait for the next meeting with a counselor, or never discussed, “us time” can be a great way to rekindle feelings and interest in our partners. There are likely many other benefits to adopting a regular schedule of “us time,” whether it is once or twice a day, a week or a month. Developing this habit as a couple may not only heal but prevent misunderstandings and the threat of drifting apart. As long as respect and openness are present, couples can approach this as a safe and even sacred time to say what often goes unsaid without the prompting of a counselor during marriage counseling sessions. Don’t feel like you need to wait for a licensed marriage counselor to prescribe this for homework during a therapy session; try out “us time” on your own. See how it works, and give it several attempts. You and your partner may be exercising relating muscles you haven’t used in a while. Like physical exercise, it may take repetition and time to see the desired results, but it will be worth it. If you would like to discuss your relationship issues with a caring professional and relationship specialist, contact Symmetry Counseling to learn more about our relationship and marriage counseling services and schedule a consultation today.